New 1997 Simplicity uncut girls sewing pattern # 7746. Toddler Girls sizes 3 - 4 - 5 - 6. Design your own.. 9 great looks one simple pattern. Dress has full skirt gathered to button front bodice at raised waistline seam has long sleeves with buttoned cuffs or short sleeves, optional patch pockets and can be made with pointed collar with optional purchased ribbon rosettes, band collar or knotted collar. Dress bodice and skirt can be cut lengthwise or crosswise of border printed fabric. Be creative..design your own! Will make a cute Christmas dress! More new and vintage sewing patterns listed. ** Uncut, all pieces included with instructions. 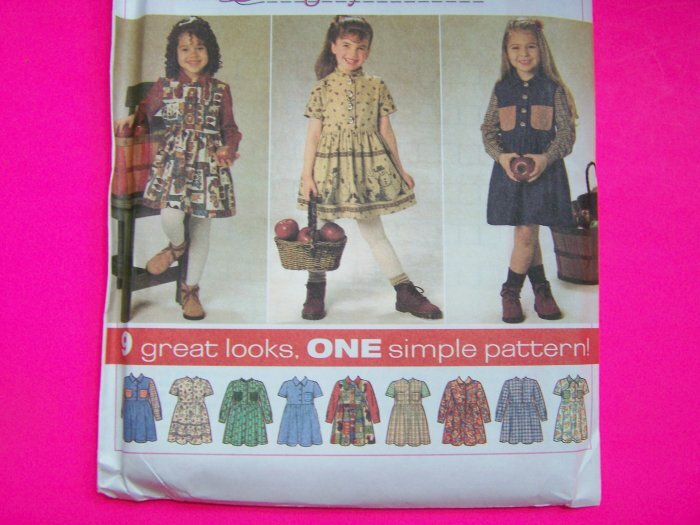 More new and vintage girls sewing patterns listed. Measurements: Chest 22 - 25". Waist 20 1/2 - 22". Hip -- 24 - 25 - 26". Approx. height 38 - 47". Suggested fabrics: Flannel, gingham, laundered cottons, baby cord, broadcloth, calico, chambray, pinwale corduroy, pique, lt wt velvet. Bodice and skirt also in border printed fabrics. S & H to the USA is $2.25 and $1.00 for each additional sewing pattern. S & H to Canada $4.00. International: Paypal only. Please ask for your countries shipping cost. I Have over 12,000 new and vintage sewing, crocheting, knitting, plastic canvas patterns in stock.